Do you want to correct the intensity of colors in an image by adjusting its hue and saturation? An enormous number of hues, or properties of color, can be found in the red-blue-green (RGB) color scheme. Each defines the different shades and nuances traced in between the pure representations of these colors. Correcting the hue and saturation or colorfulness of an image can drastically change how it looks, making it more (or less) bright and intense. Load all the images you intend to correct, either by dropping them one by one directly into the reaConverter window or by browsing your computer and adding single files and/or entire folders. In the Edit images tab, click Add action and then Color Adjustments → Hue/Saturation. 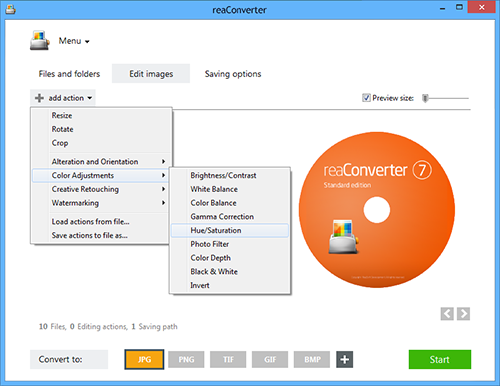 Here you can manually correct the hue and saturation of your images, and check how your adjustments work in real time by ticking the Preview button. Go the Saving options tab and decide where you want to save your corrected images. reaConverter allows you to save them in a local folder or online, directly in your Google Drive or Dropbox account. 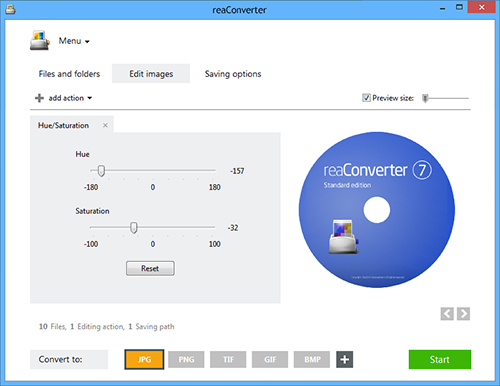 Finally, in case you don't want to use reaConverter simply as an image editing tool but also to change the format of your images, pick a new extension for your output files. 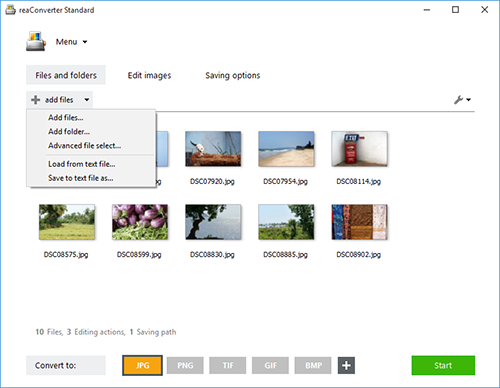 Click on one of the buttons placed in the lower part of the screen to opt for JPG, PNG, TIF, GIF or BMP, or find more options when clicking the Plus button, including less known and rare formats. Then simply press the Start button and enjoy your new image files soon. Command-line hue/saturation tool is an advanced feature meant for professional use, and is available in Pro edition only.